Olympus has acknowledged the banding that can appear in high ISO OM-D E-M5 images shot with the Panasonic 20mm F1.7 lens and says it is working on a fix. In the meantime, the only solution is to avoid high ISO settings when using that lens, for now. It says that it has tried 'every possible combination of body and lens,' and has not found the problem with other lenses. Hopefully this will help with the lock-up issue as well. My OM-D with the 20mm locks up when it goes to sleep frequently. Hmm that is nice that Olympus is acknowledging it. I am planning on getting a 20 in the next week or so and I am worried about potential banding as well using it on my OM-D. Opinions seem very split on it with some saying it causes it and some saying it doesn't. In my 2 weeks of OM-D use I'd say other than test shots I have only used over ISO1600 a handful of times. At least in general lighting, even with a measly little 60w equivelent LED or CFL light in the room I can shot my Sigma 30mm wide open or my Pany 14 or Oly 45 at an even wider aperature and be fine with the shutter speeds and IBIS. That said, I'd also be a little annoyed if it turned out that approaching, reaching or exceeding ISO1600 produce really bad visual quality because of shadow banding. It would be nice to have the wider aperature to gain even better handhold ability, not just equal what I have with slower lenses because I can't use higher ISOs. Fingers crossed I don't run in to the issue. I am not unduly worried - I really like this lens, but as noted by another user, it excels in low light at f1.7 so using at high ISOs isn't typical use. However, I would like to get one of the bodies and BH & Adorama still don't have them. Can anyone point me to a US source for these cameras, please? Thanks. Oh boy. Here we go. Get ready for the "knowingly selling defective equipment" deluge from this forum. In this case, however, no one probably cares since Olympus can't seem to be able to ship the camera in the first place. Heck ... with their luck they probably get the camera shipped with whatever firmware version that fixes it installed already. That's one advantage of have such a limited supply. Just one more reason I'm glad I bought the 25mm and got rid of my 20mm. I seem to have zero banding issues with my OM-D + lens combo. Must be an indivudal lens or camera body specific issue. I just keep the 20 on my gx1 and my pl 25 on my omd. At least it is only the one lens that every m4/3 user owns. I always found it weird that m43 lenses have updateable firmware. I bet this will be fixed by a firmware update to the 20mm f/1.7. One could say Olympus has already come up with a solution-IBIS. With the easy two stop advantage it affords you generally don't have to resort to high ISO shooting across a wide range of shooting conditions where you would have to with the IBIS-less Panasonic bodies. @Sandyramirez - Panasonic has no motivation to help solve the problem? I guess the money that they could make from selling their lens to E-M5 owners is no incentive, huh? SandyR, Panasonic is about to plow $630 million into Olympus. I would say they are more than motivated to help. They are partners in the µ4/3 consortium. 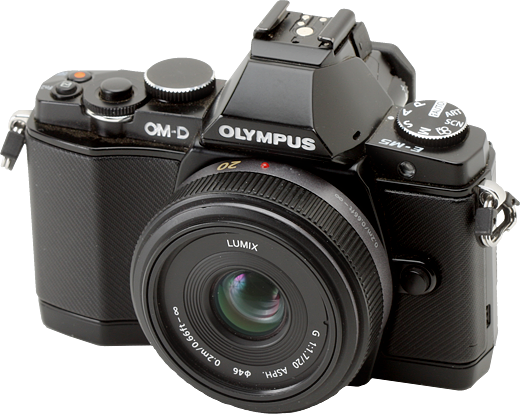 Olympus will fix the issues, because they share the same mount compatibility. They are competitors only to a certain point. Oly and Panny will BOTH benefit from a fix for this. It's a record! A NEW camera that ONLY bands above 6400 with ONE lens. I've been playing around with this combination and haven't noticed any banding. The whole point of the 20mm f1.7 for me is that you don't need high ISO though, so I don't think I've ever pushed it above 1600. Size/handling-wise, the 20 is perfect on the OMD body. How the heck does a lens cause banding? Inst that a sensor property? Easy. Lenses are no longer just glass. They contain electronics and motors that emit noise and electric interference, and if the camera is not shielded well for a particular frequency (like seems to be the case here), then these kind of problems arise. ooops... sorry Martin, I was writing! Consumer advocacy... one more reason to love this website. I'm still waiting on my E-M5 to arrive, but the 20mm f/1.7 has been my favorite lens for the GF1 since I bought it in January of 2010... and I'd hate to have to choose between it and the new camera. I notice they don't specifically say how low an ISO one needs to avoid the problem, but from what people have posted here that is variable. For some it starts happening at 1600, others at 3200 or higher. I don't know if it will be an issue for me, but it's nice to know they are working on a solution. I wouldn't worry too much about it. I picked up a 20mm f/1.7 about a week ago and haven't seen any banding on shots taken with it on my OMD. I do keep the ISO low. Unless you're trying to get a fast shutter speed to stop movement, IBIS plus f/1.7 will allow you to keep the ISO well below 1600 in all but the most challenging lighting situations. Don't want to choose, then keep both. Seeing as the GF1 is puke worthy @ ISO 1600 and above, you're still in a better position even with the banding problem. Interesting. Banding with only one particular lens. The metering program could be wrong with a f/1.7 lens, like underexposing the sensor and digitally pushing the image with banding appearing. That's the best explanation I've heard yet for what might be going on. If it was a camera/lens communication problem leading to incorrect metering then the camera would just under/overexpose. The only reason it would then push/pull back to correct exposure is if it *knew* it had made an error, in which case it would be a very very easy firmware fix. I wonder if this has anything to do with interference between the lens and whatever it is that causes the constant humming noise on the E-M5. If it is something of this nature, I would think it would be very difficult to fix. I would think electrical interference is more likely..